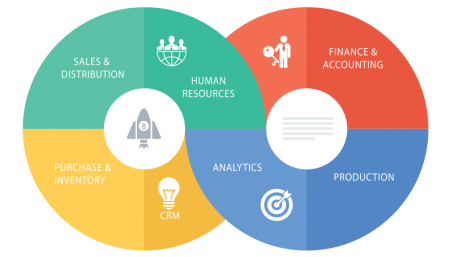 Enterprise resource planning (ERP) is the integrated management of core business processes, often in real-time and mediated by software and technology. It refers to the systems and software packages used by organizations to manage day-to-day business activities, such as accounting, procurement, project management, manufacturing, sales and human resources. Kiote Services ERP solution is feature-rich while also providing an integrated ERP experience. Most importantly, we provide the support for this new initiative that ensures your organization can ramp up quickly and realize concrete benefits from the implementation. Consolidate your enterprise’s planning, inventory, sales, marketing and accounting requirements into one management system. Combine all databases across departments into a single database that can be accessed by all employees. Automate the tasks involved in performing a business process. Get the most efficient stocking method and improve all your internal operations. Keep track of deliveries from your suppliers, all within a single application. Our solution prepares all operations for you, according to your own logistic rules: push rules, pull rules, minimum stock rules, etc. Optimize the planning with the scheduler to reduce your process time. Convert quotation into sales order in a click. Easily record contracts and track invoicing phases, renewal and upselling and manage your maintenance contracts with recurring invoices and automated task scheduling. Elegant and complete, our accounting software is for businesses of any size. Record transactions in a few clicks and easily manage all financial activities in one place. Automate basic day-by-day tasks and sync your bank statements within the app. Activate features on demand; from integrated analytic accounting to budget, assets and multiple companies consolidation. The user interface is designed with productivity in mind. Manage your entire customer relationship. All in one place. Keep track of your employees’ status, job titles, contract type and dates, and their schedule. Create weekly and monthly timesheets and follow the time spent by your employees on projects. Keep track of your employees’ presence at work. HR managers can easily report employees’ monthly presence with the menu entry and state. Manage holidays, legal leaves and sick days. Design challenges, goals and rewards with clear targets and objectives to drive engagement and reward your employees’ performance. Your organisation at your fingertips. Our ERP solution is mobile-friendly and dynamic and will suit any mobile device or tablet. Whether you are at a customer’s place or in your car between two meetings, you won’t miss any important information thanks to the notifications. Enterprise Resource Planning Software Solution. An integrated management for core business processes. Mediated by software and technology.